The planner’s 52 recipes for adopting "unloved vegetables" are chock-full of the kinds of lowly garden rejects people don’t seem to want to eat anymore, according to the authors. Brussels sprouts, beets, cabbages of all sorts, spinach (how is spinach unloved? I wasn’t sure about that one), rutabagas, turnips, parsnips, and other "forgotten" vegetables are featured in the pages of the planner, accompanied by humble illustrations. And humble is the key word here. The preface of the book describes "The unloved, the forgotten, the battered…. Our society doesn’t know how to move forward without leaving these humans behind, rejected and at a dead end. In the garden, we find the same thing with vegetables." Because beyond the growing and distribution of organic vegetables, the Cocagne network takes care of forgotten people as well. Developed in the 1970s, long before organic vegetables were fashionable, the original concept was based on short-distribution circuits, which means that you, the consumers, buy directly from the producer (like at your local famer’s market). But it was also firmly grounded in the idea of re-integrating long-term unemployed people back into the workforce. A little like a CSA, the Cocagne network of subscription gardening now distributes over 25,000 baskets per week! All the baskets contain certified organic vegetables, which were grown by people who now have work, after being unemployed and then marginalized by society. Nowadays, the Cocagne network has branched out into related fields: there are innovative urban micro-farms, canneries, honey production sites, distribution of vegetables to school cafeterias, organic flower gardens, restaurants, and catering services. And, of course, there are the newsletters and the daily planner. In addition to the 52 diversified recipes – including one for a fennel and mango cake! – there are lots of extras: a calendar of seasonal vegetables, recipes for jams and chutneys, and my favorite, 2 pages of astuces (tips) and remedies from grandmothers. 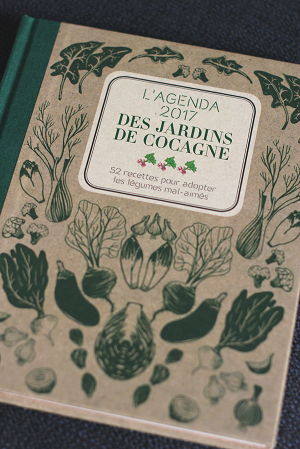 So if you’re in France and looking for organic vegetable baskets, delicious recipes, flowers, or even a recipe for a blister remedy, or a natural blush made from beet juice, look no further than the Cocagne network! April is a splendid month for serving lamb – and for eating spinach. The two combine wonderfully here, along with spices fit for an Indian-inspired feast. In this recipe, the word "confit" is used liberally. Unlike duck confit, the lamb isn’t cooked entirely in fat, but the fat from the lamb and the slow cooking do confer confit-like properties to the dish. If you want to find out what the heck confit really is, this article does the trick! And if you don’t want to eat all the fat in the final dish (there’s really not that much! ), make it ahead of time, let the dish cool, and skim away some of the fat that rises to the top of the dish. Either way, cooking with fat makes this dish extra-tasty – try it for yourself and let me know what you think! 2. In a heavy enameled Dutch oven or other heavy-bottomed pot, heat the oil over medium heat. Working in batches, brown the lamb cubes, making sure to leave space around them so that the heat can circulate. Use a pair of tongs to make sure all sides of the meat cubes are browned – this step ensures lots of flavor in the final dish. Remove pieces of meat as they’re browned, and place them in a bowl next to the stove. Repeat until all the meat is browned. Remove the pot from the heat and set aside. 3. While you’re browning the meat, use a food processor to puree the onion, garlic, and ginger until you get a paste. 4. Once the meat has browned, degrease the pot slightly if necessary, leaving about a tablespoon of oil covering the bottom of the pot. Place on medium heat, and add the spices, stirring and cooking for about 1 minute. Immediately add the onion puree and cook, stirring constantly, for about 3 minutes. Then add the tomatoes and salt, and bring to the boil. 5. Add the lamb cubes, as well as any juices that accumulated in the bowl. Stir and bring to the boil. Cover, lower the heat to minimum, and cook for 50 minutes, stirring occasionally. The meat won’t be entirely covered by the sauce. 6. Add the chopped spinach, bring back to the boil, and cover again. If you need to add the spinach in two batches, that’s fine. Cook for 15 minutes more. 7. Add a scant ½ cup (100 ml) of hot water and continue to cook uncovered over medium-high heat for 5-10 minutes, stirring constantly so the water evaporates but the ingredients don’t stick to the bottom of the pot. 8. Taste for seasoning and adjust. Serve with basmati rice and, acording to the Jardins des Cocagnes recipe, a hearty red wine from the southwest of France like Pic-Saint-Loup or Cahors. i always enjoy your messages with cheerful news and excellent food! Thank you, Alison! I was surprised at how quickly this recipe came together once the meat was browned. And you’re absolutely right, this dish combines such great ingredients!